AddressThe address for this sale in Big Rock, IL 60511 will no longer be shown since it has already ended. Adding things daily. Stop back to view listing. Please respect the gardens and plantings! Victorian bedroom set. Original finish. 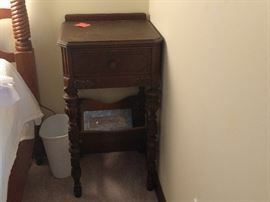 Full-size headboard, footboard, & side rails, night stand, tall chest of drawers, and dresser with mirror. See next 3 pix. 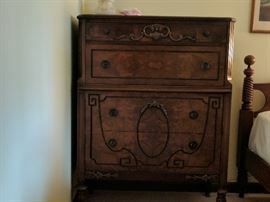 Victorian chest of drawers. Part of set. 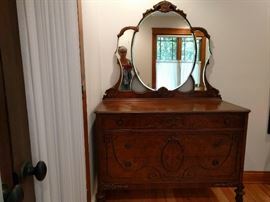 Victorian dresser with mirror. Part of set. Victorian nightstand. Part of set. Top: Antique doll & stroller c. 1860s Doll has leather and cloth body, porcelain head and appendages. 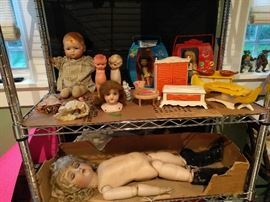 Bottom: (L to R) Tressi, Cricket, Betsy McCall, Twist and Turn Barbie, Ken (original, I believe), Ken (1 model newer), Skipper (original), Ricky (original), & Francie (original). 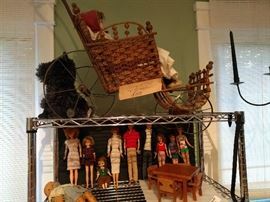 1960s baby doll, hand-made doll table & chairs. Top: Antique doll with cloth body & porcelain head, 2 Kewpie dolls (one plastic, one porcelain) Jan (original with original case & extra clothes), Heidi (original with original case & extra clothes), 2 dolls from early 1900s, doll head from early 1900s, furniture for Heidi & Jan. Bottom: Doll from early 1900s; great condition, but needs to be strung. Isn't she pretty? Baby doll from late 20s/early 30s. She has been well-loved, and shows it. She's still my favorite though. 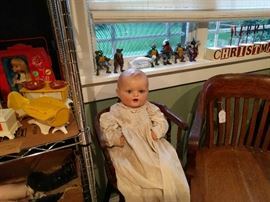 She is sitting in an antique high chair. 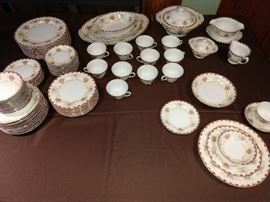 Vintage china 10 complete place settings, many extras, & serving pieces. 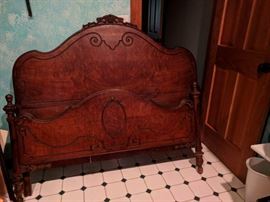 EXTENSIVE collection of Fostoria American, including several rare pieces. 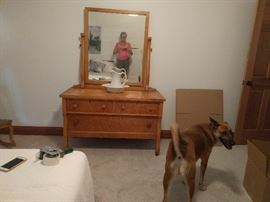 Birdseye maple bedroom set, includes dresser with mirror shown (photo-bombing dog not included! 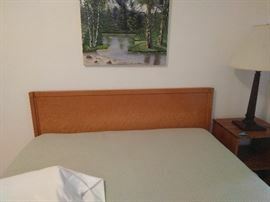 ), full-size bed, oval table, rocker, & straight chair. Original finish. See next 4 pictures. Birdseye maple bed. Footboard and side rails included. 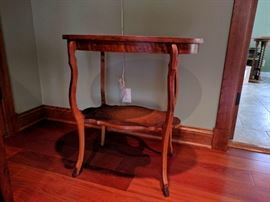 Mahogany china cabinet. 1940s. Original finish. Contents not included, but available for sale. Ethan Allen Royal Charter library unit (c.1976). Dark oak. Sorry, silver not included--but available for separate sale. Man-sized desk! 1940's vintage. Huge! One file drawer, 4 box drawers, pull-out work surface on each side. Original finish. Antique Desk -topped barrister bookcase. Four piece unit. Original finish. Needs a little love and YOU can make a ton of money off this piece on eBay!! See next picture. Antique Singer sewing machine cabinet. No machine inside. Great conversation piece. Perfect for the person who hates to sew! Many Singer machines will actually fit. Oak, swivel office chair. Original finish. Wood arm chair. Original finish. Antique chair. Has upholstered piece that can be used as a seat. Original finish. Upholstered wood arm chair with cane inset. Original finish. Antique candle sticks, bread bowls, stoneware bowls, and bean pot. Just an example of the cool, old dishware available. Bottle is not old, but is pretty cool. 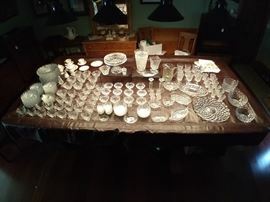 16 place settings of china, with serving pieces. Stainless propane Sportsman grill. Tail-gating season around the corner! BRUSH-MASTER Chipper/Shredder 15HP ! This isn't a toy. Says it will do a 2x4! Buy it and give it a try. I prefer chipping the 2" to 2-1/2" branches which it will do with ease. Great condition with hitch for garden tractor. 5 HP Sears tiller. Just keeps on running. Starts in a pull or two. Magnum XR9 Takes a 5 gal bucket. Stored with Pump Armor in it ALWAYS!! Old school lawn chairs. Set of four. Sold as a set. Dear to owner's heart. "Won't be a bargain." (Said the guy. Talk to the woman.) Whaaaat! DeeZee poly chest, 39"L by 27" W by 17"H! Very lightly used. Great for tailgating. I use a smaller one. My eyes were bigger than my "party" when I got this. DeeZee P/N: 6537P Look it up. Standalone Icemaker. Great for RV. Also a good working dehumidifier.